I am back at Camp Timber-lee! I’ve lost track of how many times I’ve been here since 1998, since I’ve only missed a few years but spoke multiple times other years – it’s like a home away from home for me. And while it was once the camp for the kids at my church, it’s now a camp in Wisconsin I fly back to speak at from Colorado – so I guess they like me! I feel like family here, even though I only get to be a small part of the massive operation here for only one week of the year, but I count it an honor and a privilege every time! This year the theme is TRANSFORMED and what a great opportunity to challenge kids to allow God to transform them or some area of their life. I just got all unpacked and moved in after a long day of travel, so I thought – just for fun – I’d post a picture of my closet in my cabin for you to get a glimpse into my style of teaching. I’m posting this for a few reasons. Thirdly, because I want to encourage those of you who teach kids to go the extra mile to engage kids when you teach! Yes. It is a lot of extra work and takes extra effort to include props and fun games and include interactive elements in your lessons – but the results are always better and higher because the kids are engaged, listening, and you earn the right to be heard. This is explained in greater detail relationally in the Kidology Handbook, and from a teaching perspective in the The Kids Church Cookbook. Now, don’t get me wrong, it isn’t just about being fun! It is fun with a purpose! Every game is an object lesson and every illusion illustrates a lesson point, and that takes time and prayer and planning. It’s rarely in the curriculum, at least not to the standard I demand, and rarely with much scriptural basis. I had to collect Transformer toys for a year and spend a lot of time working props to fit my lessons. Fourthly – I wanted to have some fun with you. Take a close look at the picture. And in comments, how many of the items in my closet can you name? I’m not going to approve any comments until the contest is over! Whoever guesses the most correctly, will win a cool (and valuable) prize when I get home! (If any comments do go live, it may be they are per-approved for being previous commenters – no fair using their comments for hints!?) I put them all live and announce the winner at the end of the week! I’m curious how many of my teaching props some of you kidmins out there may recognize. If you have questions about my props shown, ask in a separate comment, so I can approve and then answer! Red and Purple peddle racers? And the three things I noticed but couldn’t figure out were 1. The red and black checkered board on the top shelf (magic trick/EE cube?) 2. The yellow box under the Black & White chain trick. 3. The two little green tree looking things with the 3 white cages attached to them ( a catch the ball game of some sort). Alright…going to take a stab at this….I see…. bible, hard hat, robot puppet, parachute, big deck of cards, stacking cups (or are those buckets? ), jump rope, egg carrying spoons, the claw, red rope, plastic chains, basket case games, caution cones, safety vest, sketch book, hula hoops, giant crayons (or crayon banks? ), play money, My Life Book, toilet paper, Jolly Ranchers, Velcro Ball Catcher Game, Super Soaker Water Gun, giant dollar bill, ball glove and balls, ping pong paddle, slingshot, transformers, Sparklers, Wiffle balls with catch cups, Ziplock bags with chalkboards, envelope for Dots Impossible magic card trick, scoop shooters, cup & ball trick, Pedal Go’s, I can’t tell what that silver thing is on the side (that has slots) is the rolled up paper on top shelf a map? I can’t tell what the game is in the yellow box – my guess is anywhere from rock em sock em robots to boggle/scrabble! haha, looks like silver rings on the top, a batman or GI Joe action figure on top of them (?) The missing piece (from a children’s spiritual puzzle), Foam balls, Tennis balll, Do you put those Green/Blue things with the 3 net looking holders for balls on your head? looks like it has straps…don’t think I’ve ever seen them before though so not sure what they are…..and I can’t see the rest good enough to guess…..but that’s a lot of stuff!!!!! Have fun at camp!! Hunting vest, robot puppet, various balls, jolly ranchers, hula hoops, super soaker, skeych book, cards, cars, “Jesus” hankichief, grabber, silks, small buckets, envelopes, ropes, hat, eggs & spoons, safty cones, chains, crayons, velco balls and glove, catch it basket for waist, paper towels, basket case, monkey, missing piece trick, paddle. Screaming Monkey, Production Box, Chinese Linking Rings, Pom-Pom Balls, Rainbow Ropes, Missing Piece Dollar Bill, Change Bag, Basket Case, Cup & Ball Game, Magic Mitts Catch Game, Paper Towels, Jolly Rancers, Sparklers, Giant Crayola Banks, Thumb Wrestling Ring, Plastic Construction Helmet, Climbing Rope, Plastic Chains, Sponge Balls, Spoon & Egg Game, Orange Cones, Super Soaker, Rainbow Silk, Hula Hoops, Jesus Silk, “Roller Shoes”, Giant Playing Card, Robbie the Robot Puppet, Dot’s Impossible Magic Trick, Variety of Colored Silks, Sketch Book, Mini Stilts (Bucket Shoes), Orange Saftey Vest, Misc Toys, and The BIBLE! “The missing piece,” tennis ball, toy monkey, several silver rings, newspaper, 4 strings of yarn (or other string type, colors: red, black, yellow, white), story book (on the right top shelf, says “My Life”), quilt supplies, checkerboard, large $1 dollar bill (fake, possibly says something), ping pong paddle, red small tin box, and a red handkerchief. Several wiffel balls with black string through them, jolly ranchers, pretzels, frisbee, 3 basket cases, and one teddy bear. Several large crayon toys, several fuzzy balls, a DVD set, a construction sign, two 3-ring toy things, a red ping pong ball, and a book (on the far right side). A hardhat, red yarn, several plastic eggs (red, blue, green, yellow), Orange cones (probably like 10 of them? ), a red heart, a white chain, a black chain, and a yellow box for toys. 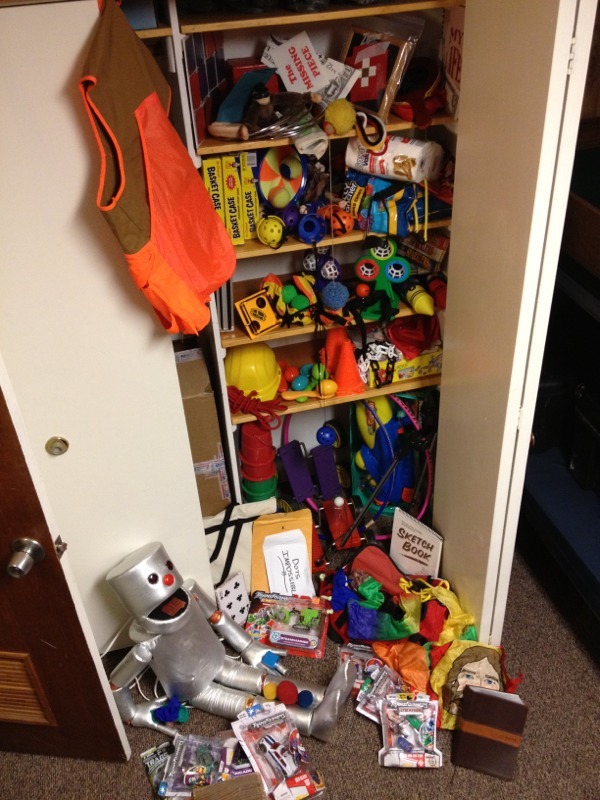 A box (left side of the shelf, red and green cups, a pink hula hoop, a large water gun in a turquoise case, a yellow dumptruck, a blue plastic ball, purple and red pedals, white bag with black strings, sketch book, white ping pong ball, large playing cards (a clubs card is on the front), a small colored parachute, picture of Jesus on a yellow background, a brown Bible, a manila envelope, a white envelope that says “dots impossible,” a large silver robot puppet, six fuzzy balls (three blue, one red, one yellow, one green), and 8 toy cars still in their packages. WOW! Everyone did such a great job – I’m going to send EVERYONE who took a stab at it a prize by e-mail, a new Comic Book that will be released on our site soon, but they’ll get to see it first! Next row: 4 boxes of a Basket Head basket ball game, vecro catching game, another catching game with balls attached to string, TP for a wrap kids up like mummies game, jolly ranchers, thumb wresting game. Floor: Bucket racking game, Peddlers, hoola hoops, super soaker, Dots Impossible magic trick, robot puppet, King of Hearts trick, sponge balls, transformer toys for object lesson and prizes, Jesus silk, Bible Sketch book magic trick, silk for silk bag, extended grabbers for a game and karate deck magic trick. Kids ministry is VERY prop intensive, but it sure engages the kids! And keeps them GLUED during your teaching!! !